Especially as part of the certification course Craig Larman emphasized that the product owner has to be the owner of the product. 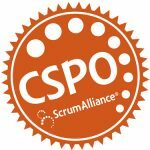 It is not acceptable in scrum to have a product owner without authority or competence regarding the product. The product owner is the business-side representative and steers the release directly. Project managers do not exist, and neither do projects. Scrum follows a long lived product culture (through product backlog and product owner) instead. In scrum the goal is to have running software by the end of each sprint (i.e., iteration). The measure for that follows the definition of done. Each sprint should conclude with a potentially shippable product increment (PSPI), which means that by the end of each sprint the software is ready for a new release. Whether the software actually is released or not is optional, of course. Also, scrum has two major requirements regarding the teams. First, the teams are self-organized. While the product owner defines and prioritizes the items in the product backlog, the team can autonomously choose the tasks to be realized and further, how these are realized. The product owner must not influence the team’s work. Second, the scrum team is cross-functional. The team members, though coming from different backgrounds do not have a specific job description anymore. They are potentially required to do anything necessary. The natural expertise of every team member shall be utilized by the others in order to learn and extend the own knowledge. After those details concerning scrum, we discussed and followed some exercises regarding the ideation for innovation as well as the communication of a vision. Each of which is an important aspect of the work as a product owner.